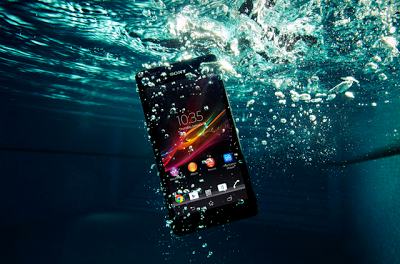 Sony announce the Xperia ZR: Who said you can't use your phone for underwater photos?! Sony are starting to make more of a mark in the Android landscape lately. This is in part down to the huge array of phones that they're launching and it's partly because their phones are well made and they have these quite unique waterproof and dust-resistant features. Today the Japanese company are back with their latest effort and this time it's a new variant on their popular Android flagship and this one is called the Xperia ZR! The devices huge selling feature is that it is water proofed for up to depths of 1.5 metres and as you can see in the video embedded below this give you the option to take video and pictures underwater! Aside from the cool water resistance the phone will fall into what is this year's mid-range with a 4.6" 720p display which is enhanced with Sony's Reality Display technology which will be driven along by a 1.5GHz Qualcomm Snapdragon S4 Pro processor, which is quad-core and 2GB of RAM. The whole thing is running Android 4.1 Jelly Bean and hopefully Sony can get updates out relatively soon, although we wouldn't hedge our bets on anything arriving until Q3 or Q4 this year at the earliest if Sony's track record is anything to go by. Obviously for those underwater shots you're going to want a good camera and that's why this phone has the same 13MP sensor which the flagship Xperia Z is rocking, which should be more than enough for the majority of people who don't have a dedicated camera which they carry with them and the front camera will be a VGA sensor, which isn't great, but it's good enough for video calls. Initially internal storage is a little short at only 8GB, but you can expand this with a MicroSD card up to 32GB in size and when it comes to the battery Sony have made us happy with a 2300 mAh unit being included which thankfully is removable so we can tax that LTE connection as much as we want and swap out the batteries on busy days! Sony have said that the Xperia ZR will come to "various global markets" in Q2, so it'll definitely be here by the end of June, but other than that there's no price, but you can plan whether you want it in black, white, pink or mint in the meantime!